﻿These stunning DAISY DROPS medium earrings by ISABELLE LELOUP JEWELRY are handcrafted in Belgium with gold-plated (23ct) Brass. 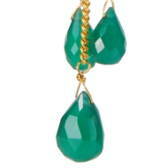 Each earring is embellished with various pear or cube-shaped green onyx gemstones. This delicate combination will gently sway with every step.